In 'Only The Dead,' A Raw Look At War In Iraq : Parallels A harrowing documentary by Australian journalist Michael Ware documents the years he covered the war in Iraq as a Time and CNN reporter navigating between insurgents and the U.S. military. Near the beginning of Only the Dead See the End of War, a documentary premiering Monday at 9 p.m. Eastern on HBO, journalist Michael Ware says one thing he feared as he arrived as a Time magazine correspondent in Baghdad in 2003 was his own lack of experience. "I was still a junior reporter," he says. "I was convinced I had arrived late. I was terrified I'd make a fool of myself." Ware was hardly a novice; he'd already spent more than a year covering Afghanistan (I first met him in late 2001, as he came through Pakistan from his native Australia, on his way to Afghanistan for Time). But the horrors he encountered over the course of his seven years covering Iraq, first for Time and then for CNN, were far worse than what he might have imagined. While working for Time, Ware began shooting video with a small, handheld camera, documenting scenes from his reporting and daily life. It's from these hundreds of hours of footage (stored over the years at his mother's house back in Australia) that he's made this exceptional, difficult and necessary 90-minute film. 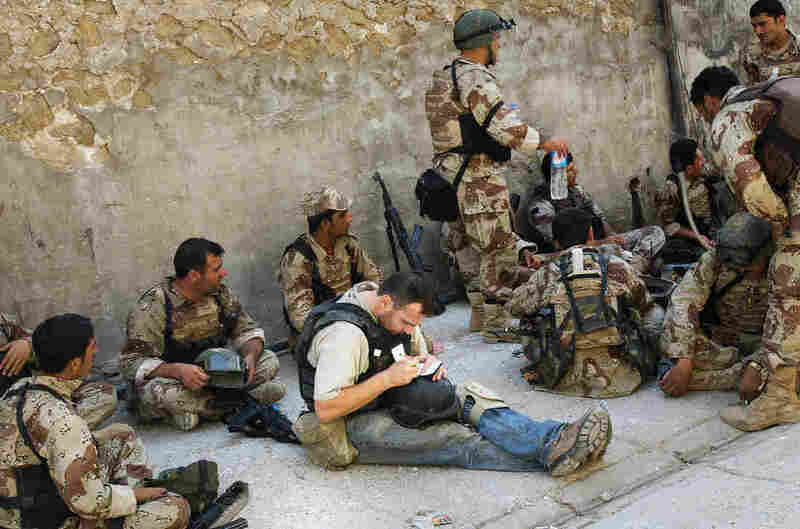 Co-directed by Bill Guttentag, an Oscar-, Emmy- and Peabody-winning documentary filmmaker, Only the Dead shows Iraq through Ware's eyes — both at the side of U.S. troops and local insurgents, and in detail that can sometimes be agonizing to watch. We see Ware at first as fresh-faced, enthusiastic, excited — much as I remember him from 2001 and 2002. The Iraqi Time staff, shown in the film smiling and joking outside the magazine's Baghdad house, was "a brotherhood," he says, like family. But the city quickly changed with the onset of suicide bombings in the summer of 2003, and by early 2004, the Time family was shattered when Omar Hashim Kamal, a beloved translator, was gunned down as he drove to work. Meanwhile, Ware — increasingly "possessed," he says, by the desire to know more about those perpetrating the violence — cultivated contacts who led him to insurgents, who in turn offered him access to their secret nighttime meetings, which he accepted, even when it meant he had to be transported in the trunk of a car. "There was guilt," he says, in witnessing them prepare an attack outside the Baghdad airport, the sound of him breathing in fear audible as he's filming. And then there was revulsion, when a messenger appeared to deliver Ware a then-unprecedented propaganda video of a suicide bomber reading out his will, bidding his pals farewell and blowing up a U.S. target. The video's sender was "the prince of princes," the messenger told him: Abu Musab al-Zarqawi, the Jordanian-born terrorist mastermind who orchestrated the 2004 beheading of U.S. hostage Nicholas Berg and whose extra-brutal tactics earned a rebuke even from al-Qaida. "It was paralyzing to contemplate a man like that choosing me," Ware says in the film. "I felt he made me complicit somehow." Ware embedded with the U.S. military as well, and much of the second half of Only the Dead focuses on American efforts against insurgents in Fallujah and Ramadi. "I could see good men here losing their grip, losing themselves," Ware says. As for himself, with the passage of time and accumulated experience of violence, "I no longer cared about dying." In an unsparing, extended scene, Ware films soldiers during a U.S. sweep of a terrorist outpost, shouting at a dying Iraqi man to "show us your hands." They drag him a short distance, blood seeping from his head and body, search his trousers, lob obscenities and urge him to die. Reluctantly, they summon a medic. They realize the man is still breathing, but nothing is done. A towel is placed over the man's face. They wait. "Through his gasping," Ware says, "it was my silence I could hear." Complicity again. Only the Dead is as much a reflection on the choices journalists make, and at what cost, as it is on the nature of war. We see Ware's face grow haggard and haunted as the film progresses. "I became a man I never thought I'd be," he says. In making this film, he's taken a brave look at himself as much as he has at the war that consumed him for so long. NPR's Hannah Bloch reported for Time in Pakistan and Afghanistan from 1996-2002.